In early January 1918, the Soviet government suspended payment on foreign debt, and in early February 1918 it decreed that all Tsarist debts were repudiated as were those contracted to continue the war by the provisional government between February and November 1917. At the same time, it decided that all assets of foreign capitalists in Russia would be confiscated and returned to the national heritage. In repudiating these debts, the Soviet government was implementing a decision made in 1905 by the soviet (people’s council) of Petrograd (St Petersburg) and the various parties that supported it. This triggered a wave of unanimous protest from the capitals of the major allied powers. The Soviet government proposed peace with neither annexation nor compensation or reparations. It also added a clause enacting the self-determination of peoples. This was the application of totally innovative and revolutionary principles to relations between States. It turned out that the Soviet government’s policy simultaneously confounded and influenced that of the US president Woodrow Wilson |1| who had made the right to self-determination of peoples a central element of US foreign policy. |2| Certainly, the Bolsheviks and the United States had different motives. The US, not having significant colonial territories, saw an interest in weakening the British and German Empires and the powers of Belgium, the Netherlands and France, in order to step into their shoes, though using other methods. Their strongest diplomatic and humanitarian argument was the right to self-determination of African, Caribbean and Asian peoples still under the colonial yoke. As for the Bolsheviks, they wanted to have done with the Tsarist Empire that they denounced as a prison of peoples. The desire for peace was one of the basic causes of the revolutionary uprising of 1917. The great majority of Russian soldiers were set against pursuing war. Almost all were peasants who wished to go home and work on the land. Moreover, for many years, since long before the start of the war, the Bolsheviks, who had been members of the Socialist International until its betrayal of the working classes in August 1914, had opposed the policy of preparation for war. They maintained that what was needed was a common struggle to bring capitalism and its imperialist phase and colonized territories to an end. 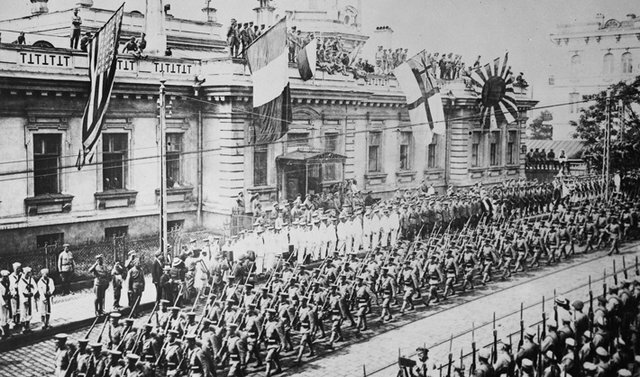 To bring this orientation to bear, the Soviet government was forced to enter separate negotiations with Berlin and its allies as in 1917, London, Paris and Washington wished to carry on with the war. The Soviet government did endeavour to bring these capitals of the allied nations to the negotiating table but to no avail. Having signed an armistice with the German Empire in mid-December 1917, it managed to drag out the negotiations with Berlin over five months in the hopes of seeing several populations of Europe, especially the German people, rise up against their governments to demand peace. It also vainly hoped that President Wilson would support Soviet Russia against Germany |3|. The Soviet government also wanted to show international public opinion that it wished for universal peace embracing East and West and that only as a last resort would it agree to sign a separate peace treaty with Berlin. From December 1917, the Soviet government began to make public numerous secret documents revealing how the major powers were preparing to share out territories and populations with scant regard for their right to self-determination. One of the most sensitive of these was an agreement between Paris, London and Moscow dating from 1915 which established that at the time of victory, the Tsarist Empire would be entitled to take Constantinople, France would recover Alsace-Lorraine and London could take control of Persia |4|. Early in March 1918, the Soviet government signed the Treaty of Brest-Litovsk with Berlin. 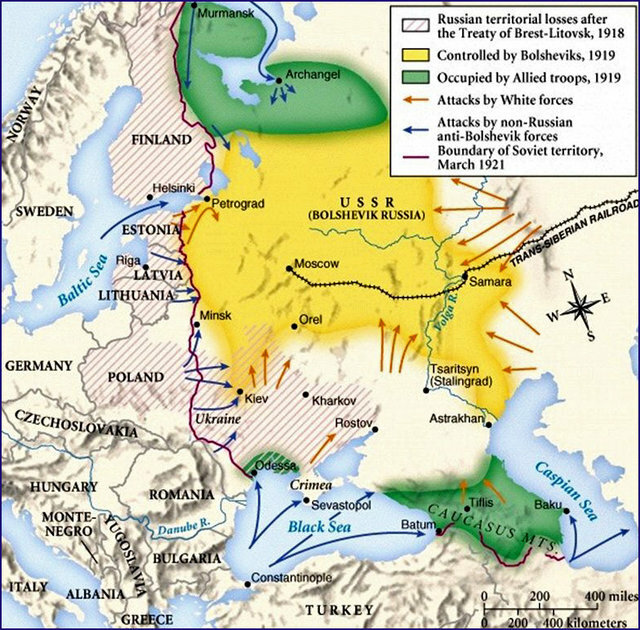 The cost was high, with the German Empire taking a large portion of the western territory of the Russian Empire: part of the Baltic countries, part of Poland and Ukraine. In short, the treaty would deprive Russia of 26% of its population, 27% of cultivated areas and 75% of its steel and iron production. The Soviet government’s call for worldwide revolution combined with its desire to end the war, its repudiation of debts demanded by the Allied Powers and its nationalization measures convinced the Western leaders that they should launch a massive attack against Soviet Russia to bring down the revolutionary government and restore capitalist order. 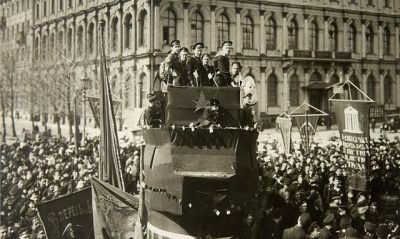 The foreign intervention began in the summer of 1918 and finished at the end of 1920 when the Western capitals took stock of their failure and were obliged to acknowledge that the Red Army had taken back control of the territory. Fourteen countries sent troops to take part in this attack. France sent 12,000 soldiers (to the Black Sea and the North), London sent 40,000 (mainly to the North), Japan 70,000 (in Siberia), Washington 13,000 (in the North with the British and the French), the Poles 12,000 (in Siberia and Murmansk), Greece 23,000 (to the Black Sea), Canada 5,300 |5|. The Japanese intervention was to last until October 1922. According to Winston Churchill, Minister of War in the British government, there was a total of 180,000 allied foreign troops. The French government was the most bitterly hostile towards the Soviet government, right from the start. There were several reasons for this: firstly, it was feared that the revolutionary movement initiated by the Russian people might spread to France as much of the French population was vehemently opposed to carrying on with the war; secondly, the Soviet decision to repudiate debt affected France more than any other country since Russian loan bonds had been issued in Paris and were mainly held in France. It is now known that in 1917 the French government had begun secret talks with Berlin hoping to conclude a peace treaty that would allow the German Empire to spread eastwards to the detriment of revolutionary Russia, on condition that Alsace and Lorraine be returned to France. Berlin’s refusal to make this concession to Paris brought negotiations to an end |6|. The armistice of 11 November 1918 signed between the Western capitals and Berlin made provision for German troops to stay temporarily in the “Russian” territories that they were occupying. According to article 12 of the armistice, Germany was to evacuate all former Russian territories as soon as the Allies deemed it opportune, in view of the internal situation of those territories |7|. 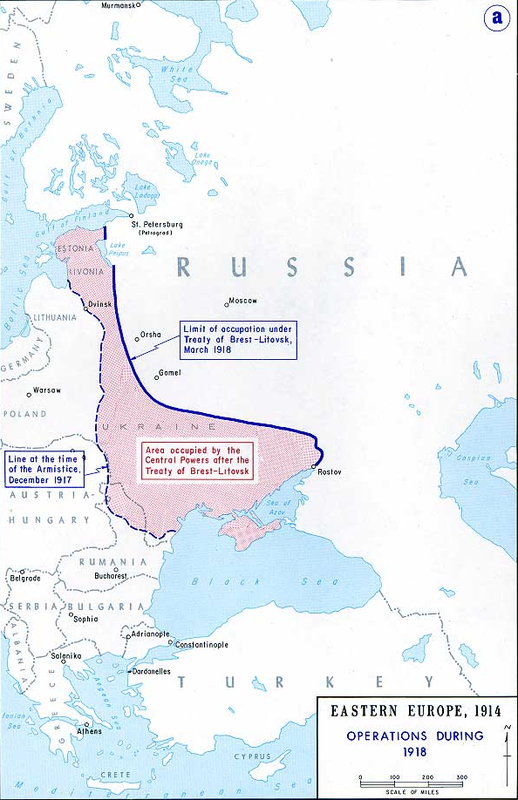 The idea was to help the imperial army prevent the Soviet government from rapidly regaining control over the territories they had conceded to Germany under the Brest-Litovsk treaty. The Allies meant to enable anti-Bolshevik forces to take over these territories which would then serve as a rear-base while they overthrew the government. Winston Churchill was one of the main hawks in the Western camp. Taking advantage of the absence of Lloyd George and President Wilson at a summit meeting held in Paris on 19 February 1919, Churchill intervened to persuade the other governments to complete their intervention by directly supporting the army of the White Russian generals. He suggested sending them “volunteers, technical experts, arms, munitions, tanks, aeroplanes, etc.” and “arming the anti-Bolshevik forces” |9|. The Allies tried to persuade the new (pro-Western) German government to take part in the action against Bolshevik Russia. Despite strong pressure from the Western capitals, in October 1919 the Reichstag (the German parliament), where socialists (SPD) and liberals held the majority, voted unanimously against Germany’s participation in the blockade on Soviet Russia decreed by the Allies. To give the full picture, it should be added that at the same time certain German generals like Ludendorff, and especially Von der Goltz, who led the last organized remnants of the former imperial army, supported military actions in the East to help out the anti-Bolshevik White Russian generals. This, with the support of the Western capitals |10|. It is quite clear that both the Western governments and those of the defeated central powers (the German Empire and Austria-Hungary) feared that revolution would spread to their own countries. Lloyd George wrote in a confidential memorandum early in 1919: The whole of Europe is filled with the spirit of revolution. There is a deep sense not only of discontent but of anger and revolt amongst the workmen against pre-war conditions. The whole existing order in its political, social and economic aspects is questioned by the masses of the population from one end of Europe to the other” |11|. This fear of revolution was by no means fanciful and largely explains the violence of the attacks against Bolshevik Russia. Foreign intervention backed up the White Russian generals’ attacks and prolonged what was an extremely bloody civil war (it caused more deaths than the World War in Russia |12|). The cost of the foreign was considerable, in terms of human lives and of material destruction; the Soviet government later demanded that this be taken into account in the international negotiations regarding debt repudiation (see below). From 1918, the Allied powers led a blockade against Soviet Russia. The Soviet government was prepared to pay in gold to import goods of absolute necessity, but none of the major banks or any government in the world could accept Soviet gold without crossing swords with the Allied governments. In fact Paris, London, Washington, Brussels all considered that they had a right to Russian gold to compensate Russia’s expropriated capitalists and repay debts. This became a huge obstacle to Soviet trade. In the United States any person or company wishing to use gold for any transaction or to take gold into the country had to sign an official statement that the gold in their possession had nothing to do with the ‘so-called’ Bolshevik government and that they guaranteed that the US had a right on it without any reservation |13|. It should be mentioned that after the German capitulation of November 1918, France managed to recover the heavy ransom in gold that Berlin had got from Russia in application of the Brest-Litovsk peace treaty signed in March 1918 |14|. France refused to return this gold to Russia, considering it as part of the reparations Germany owed Paris. The blockade of Russian gold was carried on to some extent for years. This was how France again managed in 1928 to get the Washington authorities to prohibit a payment in Russian gold for a contract between Russia and a private US company. |1| Thomas Woodrow Wilson, born in Staunton on 28 December 1856 and died in Washington, D.C. on 3 February 1924, was the 28th president of the United States. He was elected for two successive mandates, from 1913 to 1921. |2| See W. Wilson’s declaration of February 1918: “every territorial settlement in this war must be made in the interest and for the benefit of the population concerned, and not as part of any mere adjustment compromise of claims amongst rival states”. See also his declaration made at the signature of the pact founding the Society of Nations in 1919: ”The fundamental principle of this treaty is a principle never acknowledged before… that the countries of the world belong to the people who live in them”. These two citations are due to Odette Lienau, Rethinking Sovereign Debt : Politics, Reputation, and Legitimacy in Modern Finance, Harvard University, 2014, p. 62-63. http://www.hup.harvard.edu/catalog…. However in the end Wilson did not give any aid to the Soviets. |4| See Edward H. Carr. 1952. (A History of Soviet Russia), The Bolshevik Revolution (1917-1923) Vol. 3, Norton Paperback Editions, New York, 1985 (Macmillan, 1953) chapter 21, pp; 12-13, note 3. |6| Lloyd George reported these talks in his memoirs: Lloyd George, War Memoirs, IV, 1934, 2081-2107. See Edward H. Carr. 1952. (A History of Soviet Russia), The Bolshevik Revolution (1917-1923) Vol. 3, Norton Paperback Editions, New York, 1985 (Macmillan, 1953) chapter 22. |7| See Edward H. Carr. 1952. (A History of Soviet Russia), The Bolshevik Revolution (1917-1923) Vol. 3, Norton Paperback Editions, New York, 1985 (Macmillan, 1953) chapter 28, p. 308. |8| See Edward H. Carr. 1952. (A History of Soviet Russia), The Bolshevik Revolution (1917-1923) Vol. 3, Norton Paperback Editions, New York, 1985 (Macmillan, 1953) chapter 23, pp. 126-7. |9| Ibid., chapter 23, p. 111. |10| E. H. Carr, Vol. 3, p. 308. |11| Quoted by E. H. Carr, vol. 3, p.128. |12| On the Russian Civil War, see among other scholarly studies Evan Mawdsley, The Russian Civil War, Pegasus Book, 2007. |13| See The New York Times, 2 April 1921 quoted by Alexander N. Sack, “Diplomatic Claims against the Soviets (1918-1938)”, in New York School of Law Contemporary Law Pamphlets Series 1 No.7, N Y University Quarterly Review, 1938. |14| See: Alexander N. Sack, “Diplomatic Claims against the Soviets (1918-1938)”, in New York School of Law Contemporary Law Pamphlets Series 1 No.7, N Y University Quarterly Review 253, 1938-1939.